Meeting Alan Flusser last week was something of a moment for me. His 2002 book, Dressing the Man, was, after all, a fundamental part of my education in menswear and the inspiration for years of exploration and expression. But it seems not much has changed in the past 10 years. Men still need a lot of help in knowing how to dress, and Alan’s books have not educated enough people, despite the thousands sold. In Alan’s opinion, a fundamental problem is the lack of stylish and erudite sales staff. “Style, clothing is a very visual medium. You need to see something being worn well to be inspired. And most tailors are craftsmen, not stylists. Customers are usually inspired by their cutting, not what they are wearing,” he says. English tailors snipe about the success of stylish men such as Richard James, Ozwald Boateng and Patrick Grant. But they fail to learn the lesson: that men need style advice as much as they need a great fitting suit. 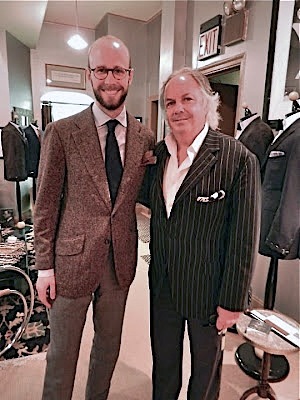 “One client came to me recently and he said, ‘I’ve been to Savile Row and I’ve had suits made at Poole, Anderson & Sheppard and Huntsman. I have these beautiful things. But when I put them on I don’t think I look any better than I did before’. He needed direction, so we helped put together a little capsule wardrobe,” says Alan. Sales assistants in department stores should be different – it is their job to sell, and usually on the basis of style, not craft. There are some good stores in New York that have this kind of staff. 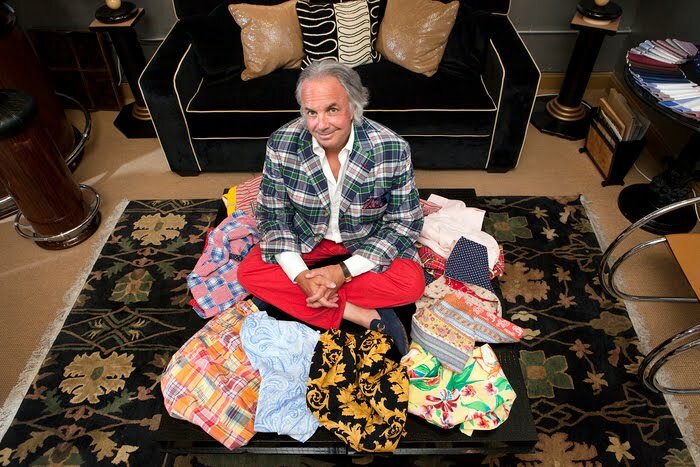 I met some wonderful examples last week at Paul Stuart, Ralph Lauren and Bergdorf Goodman. But most, particularly in the UK, fail miserably. Alan Flusser Custom has shrunk to one floor since the departure of Mark Rykken a couple of years ago (now at Paul Stuart custom). But Alan has plans to expand his cheaper, branded line of clothing (currently sold in 300 stores across the US). He shows me a series of mannequins – in suits, gilets, outerwear – each with a label pinned to them reading $170, $220 or similar. Alan’s taste is sophisticated but eclectic. We talked for a good while about the tracksuit bottoms and trainers he was wearing with his pinstripe jacket and white shirt. It will be interesting to see whether he can have any success dressing the broader American population. You can follow the discussion on Alan Flusser by entering your email address in the box below. You will then receive an email every time a new comment is added. These will also contain a link to a page where you can stop the alerts, and remove all of your related data from the site. “We talked for a good while about the tracksuit bottoms and trainers he was wearing with his pinstripe jacket and white shirt” I’m sorry did I read that right?! That is an appalling notion. It’s a look that would suggest you were homeless. I normally demonstrate reserve when commenting via the internet. However, allow me to be candid, NOTHING could convince me that this is sartorially acceptable. On the subject of style advice I have experienced two good examples recently recently. The first was at the Savoy Tailors Guild on the Strand when I went in to a buy a sports coat, shirt & square for an impromptu dinner. One sales assistant was a bit pushy, but clearly steered me to things that suited my complexion and that worked well together (Light tan sports coat with a blue windowpane check, cream shirt and blue pocket square). The second was buying some knitwear from Hackett. The sales guy there was very good at finding me exactly what suited. Compared to the terrible service at places like Austin Reed or the like this was a revelation. I had the same thought. The photograph has a very low resolution but it certainly doesn’t look good. It’s probably ironic? Thanks for sharing. True, tailors and cutters do not give style advice. That is a pity since it is already hard to find ones way through tiny cloth swatches, trying to imagine how the cloth will look like when made up as a suit. Mr. Crompton what are you wearing yourself in this picture (coat & trousers)? Looks like a beautiful coat. How are the mighty fallen, and the weapons of war perished. I think you caught him on an off day. Even legends get lazy sometimes. An amazing set of domes! I am very impressed! Well done lads! A “fashion statement” more like forced eccentricity. Not adorable. I would second Arts question. It looks to be a donegal tweed but cut by whom? The pockets are fantastic. As someone new to bespoke, what would you call those Simon? It’s my Rubinacci jacket. Search on the site for Rubinacci and you’ll find several pieces on it. While I love his book and the pictures of him from the 80’s, every time I see Flusser now he looks like a caricature of a badly dressed man. I know once you’ve mastered the rules you can start to break them but trying to understand why he decides on his horrible outfits is like trying to read Finnegan’s Wake. Is it genius that I cannot appreciate or simply a joke at our expense? Please leave the Savile Row Cutters alone. They’ve been making amazing clothes for the most stylish men in history for 200 years. Bespoke means that YOU are the stylist. You order it and they make your dreams reality. Stylish men don’t need books that spoon-feed them advice. You’ve either got it or you ain’t. Don’t blame the tailors. I’ve never seen a quote from the Duke of Windsor, Cary Grant or Gianni Agnelli bemoaning the lack of stylists in the Row. One last point: gentlemen really, really should not talk about clothes. Not in the office, not in style blogs and not in the fitting room. We’ve far more important things to think about. Style blogs be damned, I say. Please forgive my bluntness, Mr Compton. I had to get that load off my chest. For those with natural style, I would agree with Man in Mayfair. Just like those who can naturally be athletic don’t need fitness trainers or exercise guidebooks, those with natural flair for making money don’t need to read personal finance books or to employ investment advisers. For the other 98% of the population – stylists, clothes books and blogs, and advisers and information-providers in every other field serve a valuable purpose. Turning a badly-dressed man into a competently-dressed man is both an achievable and worthy goal for all, it should not be sneered in an elitist or snobbish fashion. Do champion athletes sneer at the joggers in the park? One would hope not. Trying to improve is always a worthy activity, no matter how low the position one starts from.